This was our second stay in a Southern Comfort cabin and both experiences were excellent. Staff is knowledgeable and super friendly. Awesome!!! Will definitely use Southern Comfort cabins again!! The staff member I spoke to tried to help us find a faster path to another destination at the end of our stay. Very helpful for out of towners! Beautiful view, probably the best!! Not far from the ScenicByWay or hiking trails! Hardly saw anyone on the road and there is great space between neighbors. Team is top notch and on the ball. Very nice, courteous, quick, and keep you moving right on to your vacation. I am a travel specialist and stay in a lot of accommodations. Evening Shade was fantastic. Beautiful, well appointed, all the luxury touches, spacious, tons of room, granite countertops, huge walk in showers, views to die for.....Absolutely wonderful. Parking pad is slightly tricky in an SUV, but other than that, you'll feel like you're in heaven. I definitely recommend this cabin as well as Southern Comfort Cabin Rentals and their staff. The staff was great and very helpful. I really liked how they gave a check up call the first morning. They made us feel very welcomed and was very concerned when I told her about the bed incident. She was so nice and was genuinely concerned for our safety and our well being. I appreciated that a lot. Our stay was amazing! I felt so special being in such a grand cabin surround with all the beautiful nature and the wonderful view of the Lake. We had a large group and I am positive everyone will remember this trip for the rest of our lives. I hope to make it a tradition and be back soon! There was some slight confusion regarding the paperwork but it didn't delay or change the reservation once it was figured out. The staff was professional and courteous. Everyone loved the property and amenities. Very clean at arrival and easy to maintain. Very pleased with the visit. Gorgeous mountain view, cabin is stunning !! We visited the office in Blue Ridge twice while in town. Everyone was friendly and helpful. Much appreciated. The staff was top notch from start to finish. There was a small problem with one of the showers before we arrived. The staff called to notify us immediately and let us know what actions were being taken to remedy it. It was a minor issue that did not inconvenience us in the least. Everyone we spoke to or saw was extremely helpful and nice. They made it their goal to make sure we were happy and taken care of. Holy cow! This cabin was amazing and was perfect for our family during Spring Break. The views alone are amazing and worth every penny you'd spend on the rental. The cabin itself is huge, but still cozy enough that you don't feel completed separated from the others you're traveling with. There was more than enough for our kids (17,14,11 years old) to occupy themselves with and actually disconnect a little from all the electronics. I would recommend this to anyone who is looking for a beautiful, peaceful, relaxing get-a-way. We loved it so much we've already booked it again for next year! Excellent service. 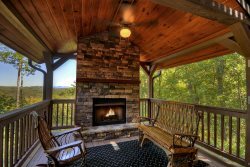 Amazing cabin with amazing views and great amenities. Loved staying at the Mile High. We will certainly come back to Blue Ridge and make it an annual trip! Everyone was very helpful and professional from start to finish. Everyone at SCCR is so nice, knowledgeable and professional! We have stayed in many SCCR properties over the years and have NEVER been disappointed! All have been so inviting and clean with everything you would need! We absolutely love STARGAZER and cant wait to come back!! !